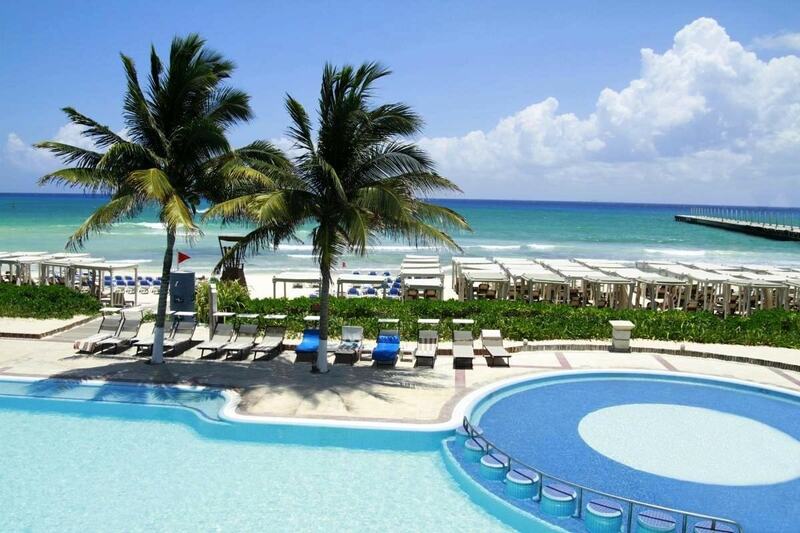 The Hilton in Playa del Carmen is a renowned 5*, all suite, all inclusive adults only hotel in the heart of town. Yes, a few of you may previously know this hotel as 'The Royal', but in late 2018 this luxurious hotel was bought and took over by the wonderful Hilton Resorts. Fear not, the amenities, concept, and even staff are all the same! Nothing has changed but the name (and branding). The slogan for this hotel is "Expect the Exceptional" and the spectacular service and quality amenities at this hotel will do no less. With beach and pool "butlers", spacious suites with double Jacuzzis, top-shelf spirits and many options for dining, consider your expectations exceeded! Located on the main Playa del Carmen beach, you are steps from the famous 5th avenue, attractions, and nightlife in town. For Exclusive Rates - Call Us! Each ample junior suite features an in-suite double Jacuzzi, a furnished terrace or balcony with lounge chairs and hammock, a stocked mini-bar and liquor dispenser, and 24-hour room service in the "magic box" privacy system. In addition, a pillow-top mattress will add to your comfort. Additional amenities include an adjustable 32" LCD TV, a DVD/CD player, and an en-suite laptop size safety deposit box. Upgrade your suite for ocean view, beach front, swim up or a one-bedroom suite. Swim-up suites offer direct access to a semi-private pool.If you want extra luxury, you can opt for one of the presidential suites or Butler service. The restaurants offer endless options to treat your taste buds. No reservations are required, just follow your craving! The Spice Buffet restaurant is open for breakfast, lunch and dinner and offers multiple cooking stations in a casual atmosphere. Enjoy breakfast or lunch with a view of the Caribbean a the Pelicanos restaurant. The 24 hour all inclusive lounge offers hors d'oeuvres and snacks while the Coffee House will serve up a variety of sweet treats and premium coffees. - Maria Marie's for French-Mexican fusion. - El Mediterraneo - Mediterranean specialties, show cooking and buffet options. - Tapas & Pinxtos - Ocean view seating with Spanish fare. - Asiana - Asian fusion. - Chef's Plate - haute cuisine exclusive to select room categories. In addition, you can enjoy the restaurants at the Gran Porto Real. The eight additional options include a sushi bar, Italian specialties, beachside grill and more. The dress code for the specialty restaurants at dinner time requires that gentlemen wear long pants and collared shirts. Sandals and t-shirts are not permitted. Indulge your body, mind and spirit at the Mayan-inspired SpaZul. Featuring Polish massage showers, a variety of massages that are available in the lush treatment rooms or by the ocean. Other spa services are available as well. Participate in a Temazcal, a purifying ceremony in a stone steam bath. The Hilton in Playa del Carmen has a dedicated wedding department. Learn more about having your destination wedding at The Hilton in Playa del Carmen, contact us for weddings. The Hilton has meeting rooms and facilities to accommodate your group or convention. Breakouts and conference rooms are also available. Get fabulous group rates and help organizing your group getaway. Contact us for group bookings. The hotel has an activities team that will keep you entertained day and night.